Shop online using the links below and raise money for Weldmar – for free! That’s right – shop online using the links below and the online store will pass to us a referral fee of whatever you spend – at no cost to you! Weldmar has now signed up as an Amazon Associate. This means we can earn a much higher referral fee than we have previously been able to get for any purchases made on Amazon. From now on, shop with Amazon using this link and we will be paid a minimum of 5% as a referral fee – with no charge to you. Weldmar Hospicecare Trust is a participant in the Amazon EU Associates Programme, an affiliate advertising programme designed to provide a means for sites to earn advertising fees by advertising and linking to Amazon.co.uk. The easyfundraising website collects together all the online shops that pay referral fees, and then passes that money back to Weldmar. So – buy at M&S online using the link from this website and we’ll be given 6.25% of what you pay – buy from John Lewis and we’ll be given up to 2.5% of what you pay. 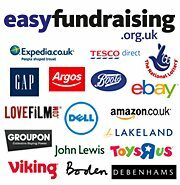 Just visit http://www.easyfundraising.org.uk/causes/wht – and don’t forget to bookmark that page for next time you shop online!